We've been overwhelmed by the amount of love and support we've received this week! Thank you so much to all our friends and family. Although we haven't had any time to thank everyone personally, please know that we've received all of your messages, emails, cards, flowers, and donations, and we feel incredibly blessed to have such a powerful support system. Your prayers and positive thoughts are what's gotten Luca and all of us through this tough time. Cute kid! I know lots of people probably say that, and parents always think their kid is cute, but lately I've been seeing a lot of...well, to be blunt, ugly babies around. Yours isn't, though! And i just realized--i have O negative blood which i believe is the universal donor. i'll call tomorrow to schedule an appointment to give blood. Manal- It was so great to see you yesterday! You are an amazing strength for your beautiful son. Enjoy Mother's Day (at home)! I heard about your story from my mom. I'll be thinking about and praying for Luca, you two, and all who love him. He is a cutie! I have been friends with Joanne & Vinny since my son & RoseMarie were kids. About 40 years. Joanne keeps me updated and I watch all the time his blogs. Luca is just incredibly beautiful. But what did I expect from Kathy & Pat's genes!!! What a cute picture of ou adn mommy Luca!!!! I hope you start to feel better real soon. your cousin-John, Jen, and J.J.
Manal, I am glad we ran into each other last night in the RMH lobby & that I was able to talk to you. I know exactly what you all are going through...and know that without the power of prayer, WE would not be where we are today. Luca will be in my daily prayers. Know that you are all in good hands, these doctors here know what they are doing and I have grown to respect them for what they do and are doing everyday. You have to be your child's best advocate, but these doctors are not without faith themselves. God Bless you all and I hope to hear good news soon. My mom sends all of her love, best wishes and prayers. You are all in my constant thought and prayers, as well as everyone in the Jaquin and McLauchlan families. Every time I look at a picture of Luca I just want to hug and kiss him. Please do that for me. He is so beautiful. The strength and grace each one of you has shown is truly inspirational. My love to you and your family. We all have you in our thoughs and encourage you to keep up being strong like you do. Lot's of love to little Luca from everyone here in France. All of you are in our prayers. We pray that Luca stays strong to become healthy. Manal and Greg may God give you the strength to indure this journey. We are sending you our love. Greg: You are a special Dad to take the time to keep us informed about Luca's daily progress. What you feel in your heart is being transmitted to all of us who pray every minute for Luca's recovery. His strong constitution and endurance is a product of two wonderful parents like you and Manal. Manal's motherly bond with her little boy especially resonates with all of us Mamas of the world. Stay strong and know that all of us are on our knees asking God to give you all the strength you need to help precious little Luca trudge through this nasty disease and come out a winner on the other end. Huge hugs to all of you. P.S. My "mini-novel" went in the mail yesterday (Friday). If one line brings a smile to you, I will feel very good and feel I've done a tiny something to brighten your day. Love you lots! My mother shared your story with me. She and Greg's father (Papa Patrick), work together. Although we too have never met, may it bring a little peace of mind to know that you, Luca, and your families are also in our prayers. 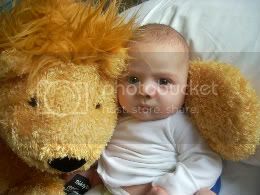 Lastly, keep posting those pictures Luca; he's got to be one of the cutest babys EVER!!! Through what seems like difficult times, never forget that God is in control. He gives us strength and courage to face all adversities in life. we must believe and trust in Him at all times. Know that Luca is in His hands. for He knows best. Our prayers are with you and the family. We have shared Luca's web site with as many friends as we know. We continue to pray each day that God has his hand upon Luca. That God continues to provide you strength and courage. We love you and miss you. You have many people praying for your beautiful little sweetheart, Luca. (Us included!) We can't wait to meet him in person when he's feeling better. Just take things day by day, and know that we're all here for you if there's anything we can do to help. Your extended family in Mississauga, Ontario, Canada wants you to know that all of you are in our thoughts every day. We are praying for a speedy recovery for little Luca and we look forward to meeting him soon. What a beautiful, special little boy he is! Manal and Greg, I know that God is sending you his strength to help you get through this difficult time. Please know we are here for you, and that we are confident that God will answer our prayers for your sweet little baby!